We had a pleasant, mostly uneventful drive from Sedona to the Grand Canyon. Yes, of course, we labored up the 7% grades, but the wide four line highways precluded us from holding up traffic, and it was nice to see we were not the only ones struggling with the grade: we played leap frog with two older motorhomes playing the “I think I can I think I can” game up the hills just like us. Low on supplies, we pulled off in Williams, a tourist town working the Route 66 and throwback retro advertising hard all over town. It was actually kinda nice, if we had more time we might have stayed for a stroll down their main street and a meal in one of the diners. We pulled into the multi-lane Grand Canyon entry station just behind one of the older motorhome’s we had been alternatively following or leading since Sedona. Our national park annual pass covered the $25 per vehicle entry fee, thus crossing the threshold of having paid for itself after only one month of use. We passed by Mather Campground, the dry camping area limited to rigs 30′ and shorter, and pulled in to our assigned spot in the full hook up area. Given the nightly plummeting temperatures and our ongoing potable water challenges, we were glad to have the full hook ups, but at $36 a night this was the most expensive place we have stayed since early February. We did a quick set up and bolted for the visiter center and canyon rim. I have previously mentioned that national Parks can pose a challenge to those travelling without a tow vehicle since everything is so spread out. 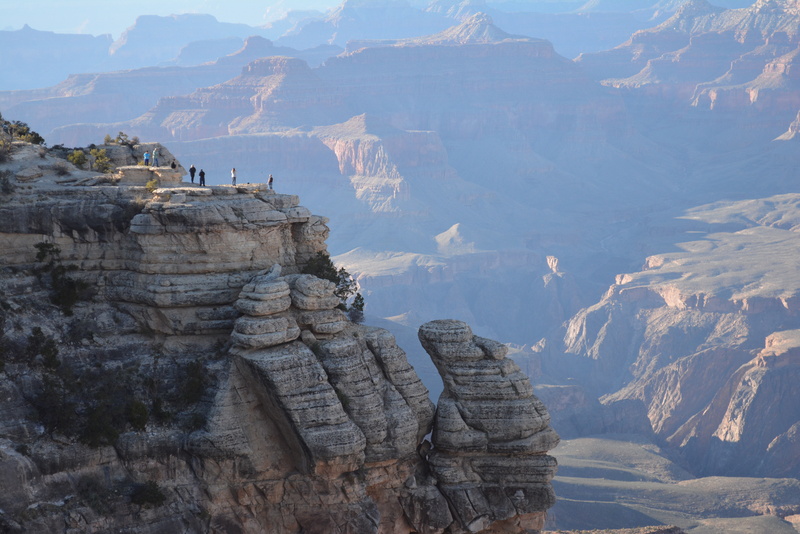 The Grand Canyon National Park eliminated this issue with the three free bus routes running continuously during daylight and even into the evening to all the rim viewing and historical areas. We were thus able to have a great end of the day with a stroll along the Mather Point overlook, getting our first view of the extraordinary, overwhelming Grand Canyon. There really is no way to adequately describe it, and pictures from the rim only capture small pieces. Simply put, the canyon is a must see if you can possibly make the opportunity. We were quite fortunate in that the two days before we arrived were rainy with temps dropping below freezing at night, but during our stay we had glorious blue skies for two of the three days and no freezing. 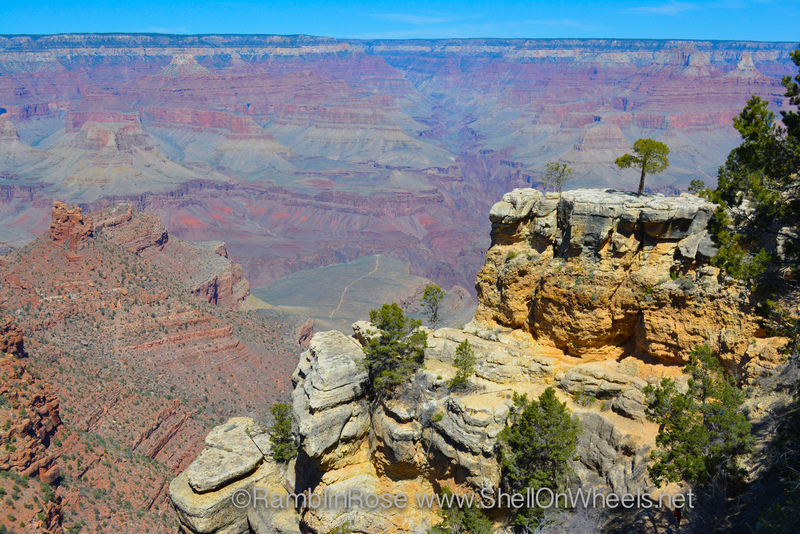 On day two we hit the visitor center to watch the 20 minute presentation on the formation and history of the canyon before taking the red line bus west along the rim, visiting every overlook and point of interest on the way. Together we are Jack & Rose, crime fighters. Day 3 we took the orange line east for the remaining overlooks, and did some light hiking part way down the into the canyon itself. There are three trails from the South Rim that lead all the way down to the Colorado River, all of them requiring two days to run in both directions. 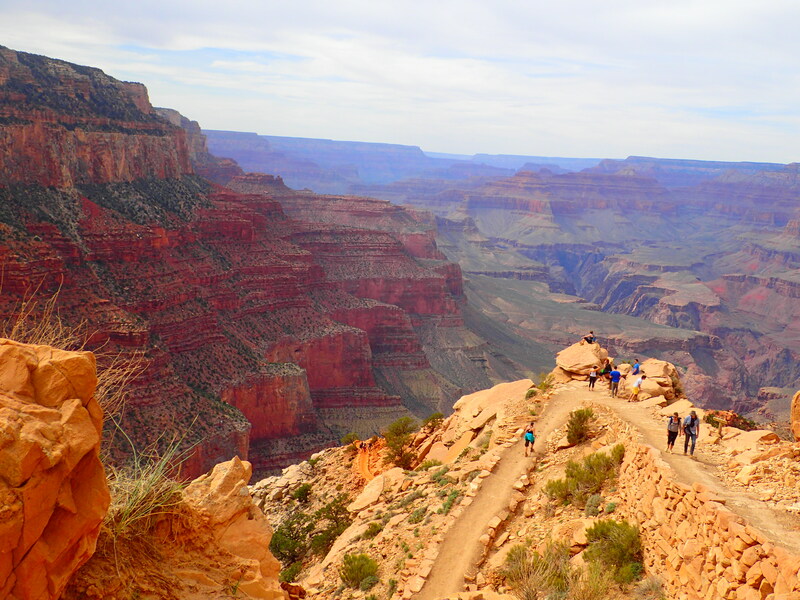 We satisfied ourselves with the moderate upper section of the South Kaibab trail so as to avoid the number of people and mule trains on the more popular Bright Angel trail. We were also fortunate enough to catch close sight of the endangered California Condor, a herd of elk that roam the park without much fear of humans, and the even more common mule deer. Mule deer. Apparently they can read signs now.